… My investigations of the neurotoxicity of fluoride started in 1987. 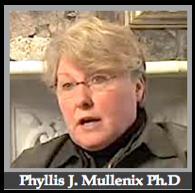 LETTER from – Phyllis J. Mullenix, Ph.D. The April 15 request for comments regarding water fluoridation is vague in that no assurances are offered as to how my written opinion will be used. Thus, a copy of this letter will be sent to Mr. Gilbert Gonzales at Fort Detrick. Without the benefit of having read the “Environmental Assessment” report to which you referred to in your letter, I run the risk of being redundant with regard to the material already prepared. With these caveats, I offer the following comments about the advantages and disadvantages of water fluoridation. To start, I must correct a statement you made in your letter regarding my being an “expert on drinking water fluoridation issues.” Prior to 1982, my knowledge of fluoride was limited to television commercials saying it was good for my teeth. Rather, my expertise was detection of neurotoxicity, which brought me to the Department of Psychiatry at Boston’s Children’s Hospital and Neuropathology at the Harvard Medical School. It was there that I met Dr. Jack Hein, Director of the Forsyth Dental Center and the scientist responsible for putting mono fluorophosphate (MFP) into toothpaste. Dr. Hein was a student of Dr. Harold Hodge, the chief pharmacologist on the Manhattan Project who conducted the world renowned studies on fluoride (1) and started water fluoridation. Dr. Hein invited me to Forsyth to study the neurotoxic potential of materials that dentists use, starting with fluoride, and we set up the first toxicology department in any dental research institution in the world. I was made Head of the department, and Dr. Hodge moved to Boston and became a member of my department where he stayed until his death in 1990. Another Manhattan Project scientist and fluoride researcher, Dr. Ben Amdur, also joined the department. In our 1995 paper (2), we reported that brain function was vulnerable to fluoride, that the effects on behavior depended on the age at exposure and that fluoride accumulated in brain tissues. Rats exposed as adults displayed behavior-specific changes typical of cognitive deficits, whereas rats exposed prenatally had dispersed behaviors typical of hyperactivity. Brain histology was not examined, but the behavioral changes were consistent with those seen when hippocampal development is interrupted and memory problems emerge. Overall, we concluded that the rat study flagged potential for motor dysfunction, IQ deficits and/or learning disabilities in humans. More recently, another laboratory investigation found that chronic exposure to fluoride (I ppm) in drinking water of rats compromised neuronal and cerebrovasculature integrity (blood brain barrier) and increased aluminum concentrations in brain tissues (8). Another study found that fluoride in drinking water of rats decreased membrane lipids important to proper brain function (9). Moreover, the latest studies have shown that fluoride accumulates in human and animal pineal glands where it impairs melatonin production (10, 11), a finding critical when it is considered that melatonin is an agent that protects the central nervous system from radiation by scavenging free radicals (12). Finally, there is a recent study published which reports that silicofluorides in fluoridated drinking water increase levels of lead in children’s blood, a risk factor that predicts higher crime rates, attention deficit disorder and learning disabilities (13). Unfortunately, the link between fluoride and the brain does not end with the above mentioned studies. In 1993 while studying the neurotoxicity associated with the treatments of childhood leukemia, we demonstrated that the fluorinated steroid dexamethasone disrupted behavior in rats to a greater degree than did its non-fluorinated counterpart prednisolone (14,15). This finding prompted a clinical study of children treated for leukemia, where it was found that the fluorinated steroid was more detrimental to IQ than the non-fluorinated steroid, in particular reading comprehension, arithmetic calculation and short-term working memory deficits were greater (16). In short, this finding has fueled a growing concern about the contribution of fluorinated pharmaceuticals to the total body burden of fluoride. As you decide whether or not to fluoridate the water supplies of Fort Detrick, it is imperative that you consider the impact on total body burden of fluoride. The soldier today is a different individual, facing a very different situation than that encountered fifty years ago when fluoridation was promoted as a “safe and effective” means to protect against tooth decay. The difference stems from the fact that 1) fluoride exposures today are out of control, well beyond the dose touted as optimum for caries prevention; and 2) people today, especially soldiers, are exposed to substances and conditions that will interact with fluoride exposure and magnify harmful effects (i.e., exposure to beryllium, lead, strontium, aluminum, cholinesterase-inhibiting pesticides, uranium hexafluoride, stress, nutritional deficiencies, increased water consumption due to extreme exercises, fluorinated pharmaceuticals, and nerve gases including sarin). In summary, my opinion is that there are no advantages to water fluoridation. The risks today far exceed the hoped for benefit. Dr. Hodge during the Manhattan Project requested funds from Col. Stafford L. Warren to do animal experimentation to determine central nervous system effects of fluoride (17). He did so because he had clinical evidence that the fluoride component of uranium hexafluoride caused “mental confusion, drowsiness and lassitude among the workmen. Yet, he never got to do those studies, and because this information was classified, he never discussed his findings with me. Perhaps, however, this explains why he was so intensely interested in my fluoride studies up to the time of his death. Therefore, in good conscience I can only discourage the notion of fluoridating the water supply of Fort Detrick. The evidence against the safety of this public health policy will keep mounting and never disappear again. My ignorance of fluoride in the beginning was a matter of chance. If you ignore this evidence today, it will be a matter of choice. Good luck with doing the right thing.